Started as a local company in 1978, G P Roadway Solutions offers the largest capability for Total Safety Solutions in Roadway Safety and Personal & Industrial Safety in the State of Hawaii. G P Roadway Solutions (and its subsidiaries Peterson Sign Company, G P Maintenance Solutions, and Unistrut Hawaii) has been a proud member of the Grace Pacific family of companies since 2003. Headquartered in Honolulu, G P Roadway Solutions has full service branches in Kahului, Maui, Kailua-Kona on the Big Island, and Lihue, Kauai. G P Roadway Solutions sales region covers the entire State of Hawaii and spans the Pacific to Guam, Saipan and American Samoa. Join our email list and learn more about who we are and what we do. Click here to stay connected! The iterations of the company that would eventually become G P Roadway Solutions began in 1978, when Sidney Quintal purchased Safety Equipment and Sign Co. Over the years the company expanded its services to material sales and barricade rentals, servicing Hawaii's burgeoning construction industry. By 1980, the company acquired the full line of Unistrut products for material sales. By 1991, all activities were conducted by three distinct companies: Safety Equipment and Sign Co., Unistrut Hawaii, and National Barricade. Together, they made up SUN Industries Inc. In 2002, SUN Industries Inc. acquired custom sign company Peterson Sign Company. In 2003, SUN Industries Inc. was acquired by Grace Pacific, and was rebranded as G P Roadway Solutions to reflect its "G P" affiliation. Finally, in 2013, Grace Pacific was acquired by Alexander & Baldwin, which brought G P Roadway Solutions into the A&B family. 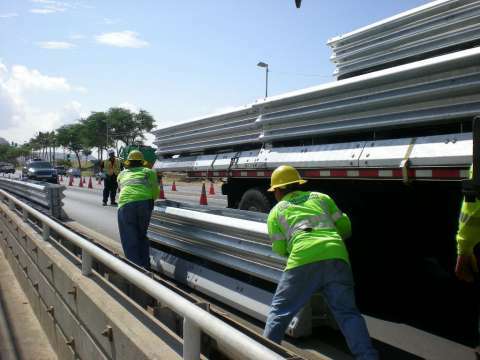 Today, G P Roadway Solutions services the state of Hawaii with sales and rentals of safety equipment, custom signage, metal framing and grating systems, and maintenance services.